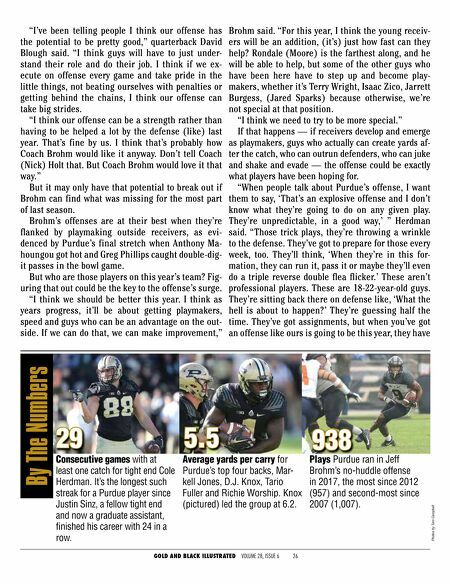 GOLD AND BLACK ILLUSTRATED VOLUME 28, ISSUE 6 27 to have their head on a swivel and think fast. "I think that's going to be a re- ally big advantage for us, being an unpredictable, explosive offense." Quarterbacks David Blough wondered if cut- and-paste was an option. How will he approach Purdue's quarterback competition this fall? Hadn't he answered that question, like, each of his previous four sea- sons in West Lafayette? Blough smiled before nearly re- peating the same refrain he's spo- ken all of that time, knowing he's poised for another training camp battle in August with Elijah Sin- delar. Again. "I'm going to give everything I've got," Blough said. "I'm going to put myself in the best position I can to compete, win the job and let Coach decide. I'm going to do ev- erything I can. Whatever Coach Brohm decides, I'm good with. I'm putting all my chips in, and I'll let them fall where they may." For good measure, Blough jokingly reeled off how he's fared in such QB competitions, probably losing count of the actual progression of circumstances. "I lost, then I redshirted, I lost, then I got in, then I won, then I won, then I got hurt, then I lost, then I won, then I lost, then I won," he said with a smile. "Whatever." Blough was a two-year starter entering last season, coming off a season in which he led the Big Ten in passing yards (3,352). But he's always been quick to remind he also threw a bunch of interceptions (21). Still, Blough looked like he'd be Purdue's starter for 2017, too, before injuring his throwing shoulder in camp. That gave Sindelar enough space to make a move. Sindelar got the start in the opener and then, in a twist, Brohm employed a two-quarterback system for the first half of the season. Brohm finally opted to stick with Blough in Week 8 against Nebraska, but only the next week against Illinois, Blough suffered a nasty ankle injury that ended his season. Sindelar stepped in against Northwestern the next week, tore the ACL in his left knee, but never missed a snap. He promptly helped guide Purdue to a bowl game and played really well: In his final three-and- a-half games, he completed 60 percent of passes for 1,192 yards and 12 touchdowns with only two inter- ceptions. But Brohm enters 2018 with his top two quarter- backs coming off significant surgeries, so they'll both have proving to do in Brohm's eyes. Blough shocked his head coach by bouncing back by the spring, less than four months removed from surgery, and Sindelar reported he was fully cleared in June, less than six months after his knee surgery. So Brohm has a decision to make, again, this year. "We're going to let it play out," he said. "It's a good problem to have. I think we'll do what's right by both of them as much as we can and let the competition play out. Both guys are coming off injury. I don't know how they're going to react. You have to make sure they get to the game healthy, and you've got to have Tom Campbell In his first season as a starter — and as an eligible player, after redshirting as a true freshman — Jackson Anthrop proved to be a steady, reliable option. He led the team in receptions (47) and touchdowns (five).